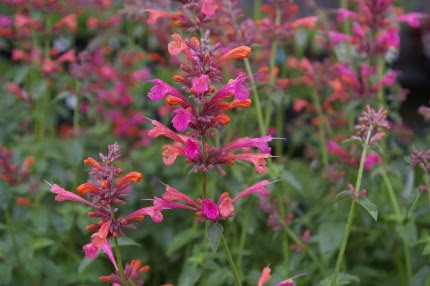 We are geared up and restocking like crazy to help you have a wonderful holiday weekend of planting and tending your garden. Our organic vegetable seedlings flew out of here last week, as did theherbs. Perennials, shrubs, vines, and annuals all disappeared intoyour cars by the wagon load. So here we go again with this crazy merry-go-round of a month called May, unloading truck after truck of fresh color every day this week. 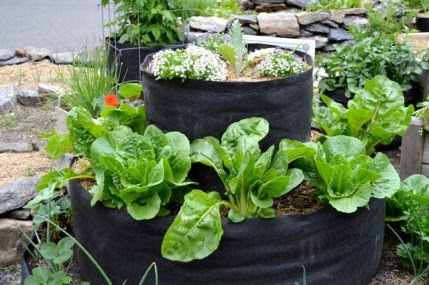 If you garden by the phases of the moon, THIS week is the time to plant vegetables that bear fruit above ground. That would be tomatoes, peppers, eggplants, squash, etc. And we’ve got plenty of them on our benches! We are open late on Thursday night, and all day Saturday and Sunday. Please note that we will beclosed on Monday, May 25th to celebrate the Memorial Day holiday and give my hard working staff a little break with their families. Shop early and then go home and play in your own garden on Monday. 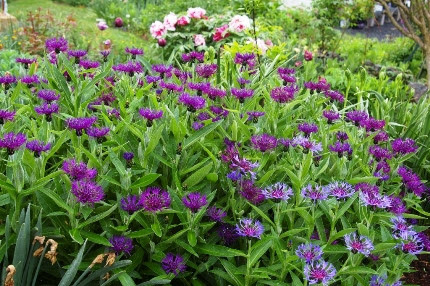 When you visit this week, be sure to check out the impressive stands of perennial bachelor’s buttons (Centaurea montana and ‘Amethyst Dream’) in our gardens. 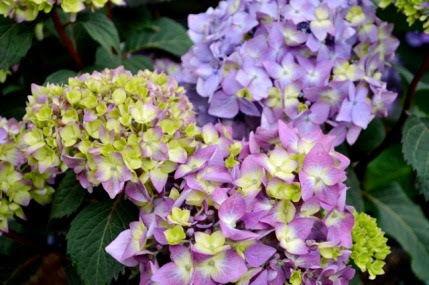 The purple one reblooms in late summer and fall each year. This week is GARDEN CLUB APPRECIATION WEEK. I give talks to so many garden clubs each year, and many of the members are friends of Natureworks and all that we do. If you are a member of a garden club, let us know when you arrive and you will get a $5 gift card. You can enter to win a $25 Natureworks gift certificate as well. This is such a magnificent week to visit our store and learn a lot about what’s in bloom in late May in the garden. Tell all of your garden club friends! We have lots and LOTS of hydrangeas. This is ‘Bloomstruck’, an improved ‘Endless Summer’. It is covered with flowers and buds. Our terrarium planting workshop is this Thursday evening. There’s still room- sign up today! 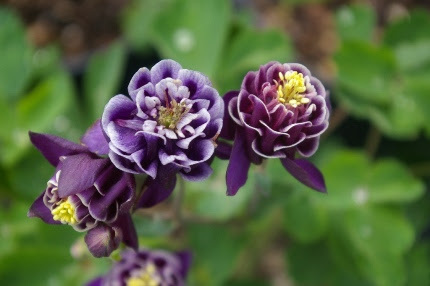 Columbines are on sale for one more week. To celebrate the holiday, we are having a few special sales, see the Sales and Specials box below for all the details. This Wednesday we are having our first Grow Organic Kids workshop of the season. The kids will plant up a spring planter to take home. 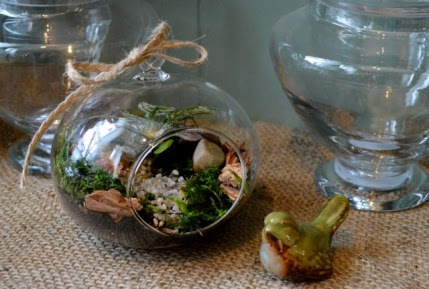 Thursday evening we are having a terrarium planting workshop. We still have spaces left in both of these workshops. To pre-register, call the shop. I am THRILLED that Barbara Torino will be here on Saturday morning to give a workshop on herbs. Last year Barbara was surrounded by customers for a long time after her talk was finished. 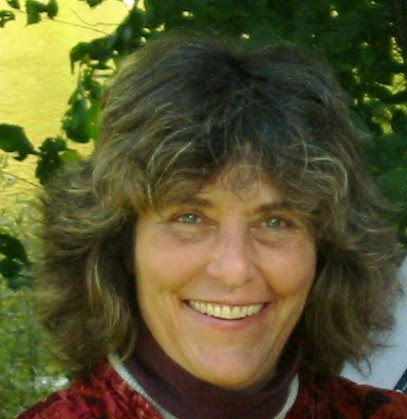 A former Natureworker, Barbara is the former chairperson of the CT chapter of the Herb Society of America. Have you seen our new back porch? People are finding it relaxing to sit and watch all the action in our nursery yard. We have lots of gorgeous, lush hanging baskets hanging from every hook. Be sure to take a few home to dress up your outdoor living spaces for the upcoming holiday weekend (see coupon on left). Calibrachoa baskets (shown above) are a magnet for hummingbirds, as are so many of our blooming plants right now. 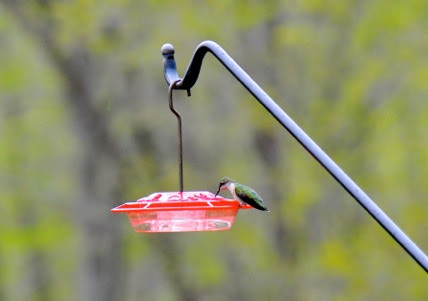 Hummingbirds are certainly back- we see them every day at Natureworks. 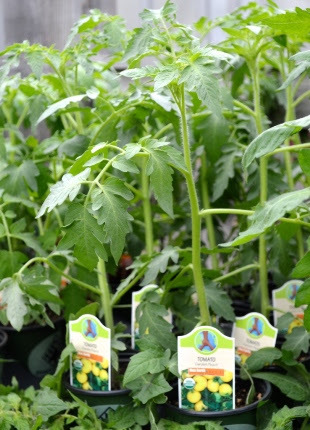 There are SO many plants you can use to attract them, and feeders will bring them up close to your deck or window. 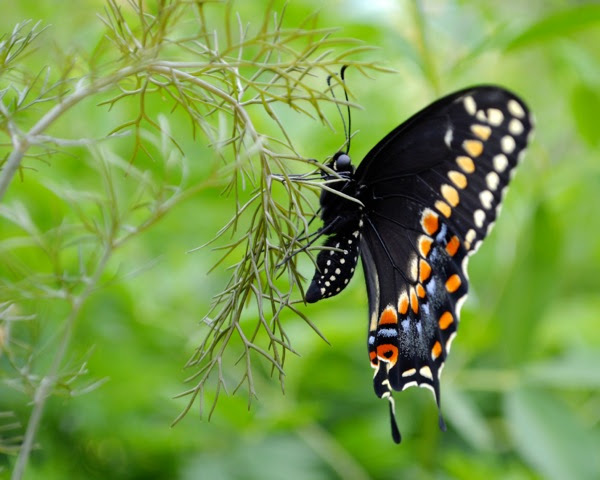 Our first butterfly hatched last Saturday and we released it into the garden on a fennel plant. This Saturday we had our first butterfly hatch of the season. Diane saved a Eastern black swallowtail chrysalis over the winter and brought it into the shop for us to observe. It hatched in the early afternoon and we had our first release ceremony. There is always something growing on the counter in our shop. We find it a great way to engage kids in the cycles of nature and teach everyone about larval plant foods of butterflies. Next to be born: a spicebush swallowtail. Lisa found the caterpillar on the sassafras tree on the edge of our property.